The art form I want to narrate here is not painting, but taxidermy. Taxidermy, the art of preserving animal pelt for posterity was started by pre-historic humans who needed the animal skins and fur for protection against inclement weather. In modern times vanity took over. Animal furs were worn for effect, the more expensive the better. Wearing expensive mink coats with very little under became de rigueur in the sixties. 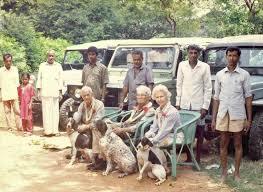 Rich widows thought of preserving their much loved pets for posterity. Taxidermy evolved to an exact art form and science as serious as portrait painting when big game hunters mounted the trophies they bagged, sometimes full body, but many times heads alone or heads attached to the skin. Hunters wanted their animal heads to be as life-like as possible - the snarling tiger caught in its ferocious beauty or the roaring lion caught in its awesome majesty - and they were willing to pay a king's ransom for them! In this art form Van Ingen & Van Ingen were the masters nonpareil. I cannot say for sure why a Dutch family started this business based in Mysore in South India and whether the family had a similar business in Holland prior to their arrival in India. Eugene van Ingen started the business in the 1890s and ever since until the firm decided to close shop in 1999 it has been a family affair. 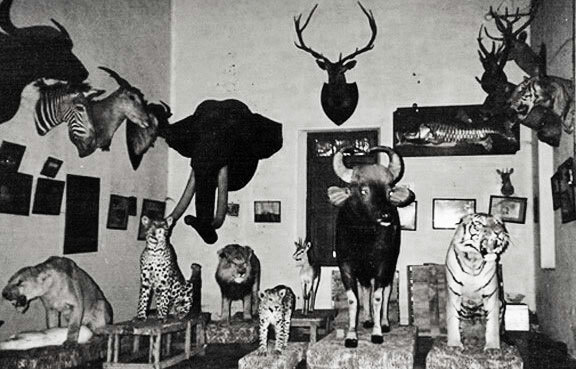 Among a handful of competing taxidermists Van Ingen was the first choice of the leading Indian royal families keen on showing off their prized hunting trophies, a status the family gained by innovation in the building of "moulds" for the heads of the animals. They imported glass eyes from Germany. Badly mounted animal heads just like bad painting render the subject into a caricature; a tiger could very well look like a domestic cat. I have seen such poor examples. When my father was professionally arranging for big game shoot for his clients in the sixties, I had the opportunity of watching at close-hand how the local sarki cobbler, dispatched from Kathmandu, skinned the animals and tanned the skins. He meticulously cleaned the underside of the skin of all muscles and fatty tissues and hung them to dry. By the time the skin came to Kathmandu it was taut, shrunk and wrinkled beyond recognition. The head was as flat as rest of the skin with two holes where the eyes had been and a bigger opening lower down where the mouth had been. Looking at the skin one could not ever imagine that a beautiful mounted head would ever come back from the taxidermist. But they did, time and again. During the heydays of Van Ingen & Van Ingen between the years 1930 and 1960 factory records show that 400 animal skins were processed and mounted every year. The skins were of tigers, lions, leopards, buffaloes and even African games sent by European and American hunters to Mysore - such was their fame! During the Rana period the ruling families sent their trophies for stuffing to India, mainly to Van Ingen. Most of my father's own collection from the 1950s also was mounted by Van Ingen. Records gleaned from an extensive study of the ledgers of Van Ingen made by British author Dr. Pat Morris showed that as late as 1961 the King of Nepal had dispatched for stuffing 6 tiger and 22 leopard skins. The last surviving son of the founder Joubert van Ingen is now reported to be 98 years old. No big game hunting is allowed any more anywhere in the world. We are looking at the end of an era and an art form. Interesting topic about taxidermy in this part of the world about which not much is written by historians. So this is very useful documentation, not to mention the fact that you have written it up as usual in a personal, entertaining manner. One reason the Dutch started the taxidermy business may have been because of the presence of the Dutch East India Company in South India at that time. And they figured how to make money from the Maharajas' fondness for hunting.